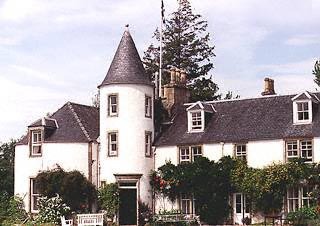 The house used as the major's house in Hamish Macbeth is Attadale House near Strathcarron. The house itself is private but the gardens are open to the public. Admission £2. Open 10am to 5.30pm April to October. Closed Sundays. The journey to this location passes some stunning scenery including high level views over Loch Carron and some other locations and is well worth the trip. Plockton to Stromeferry. Then A890 to Strathcarron. The house is on the right a couple of miles before Strathcarron. The house dates from 1755 and the gardens were started in 1890. There are some attractive water gardens, woodland walks, sunken garden and vegetable and herb gardens. You can walk quite close to the house on several sides. The track visible in the distance from the gardens going up into the hills starred as the 'Devils Humph' in "The Great Lochdubh Salt Robbery". Public access on foot is allowed along this track which goes to Bendronaig Lodge. It is a fine walk on a good day.